For the second time in two weeks, Shell has spilled thousands of gallons of oil, this time in California’s Central Valley. Less than two weeks after dumping nearly 90,000 gallons of oil into the Gulf of Mexico, Shell Oil is at it again. The company’s San Pablo Bay Pipeline, which transports crude oil from California’s Central Valley to the San Francisco Bay Area, leaked an estimated 21,000 gallons into the soil near in San Joaquin County this week. Responders are on the scene to clear oil that’s reached the surface, which county officials say covered roughly 10,000 square feet of land. As of today, Shell representatives claim the pipeline has been repaired, but have not resumed operations. Local government officials and Shell responders are investigating the cause of the leak, and currently report that no oil has entered drinking water sources or populated areas. While two large oil spills in two weeks may seem like a pretty epic failure — particularly for a company that just said “no release [of oil] is acceptable“ — in reality this is what business as usual looks like for an industry built on polluting our environment and driving climate disaster. In fact, this same pipeline sprung a leak just eight months ago in almost the same location, spilling roughly the same amount of oil into the ground. Adding irony to injury, the spill occurred on the site of one the state’s largest wind energy developments, the Altamont Pass Wind Farm. Wind energy, it should be clarified, does not release toxic chemicals into the soil or contribute to runaway climate change. Perhaps Shell responders on the scene will take note. Interestingly, Shell officials decided to wait three days before releasing a statement to the public about the spill — after shareholders convened at the company’s Annual General Meeting in The Hague, Netherlands. The spill was first detected early Friday morning, but not publicly reported until Monday evening Pacific time. Environmental watchdog groups are still monitoring the impacts of Shell’s spill in the Gulf, some pointing to the oil industry’s history of under-reporting the extent and impact of spills as reason to stay vigilant. What’s increasingly clear is that companies like Shell aren’t going to stop polluting in pursuit of fossil fuels we can’t afford to burn on their own — we’re going to have to rise up to stop them. History shows us that the more fossil fuel infrastructure we have (and we have a lot in this country) the more spills like this we’ll see. So let’s not build more — business as usual for the fossil fuel industry cannot continue. Help put an end to leaks, spills and fossil fuel pollution while fighting for the climate at the same time. Tell President Obama to end all new offshore drilling today! Ryan Schleeter is an online content producer at Greenpeace USA. 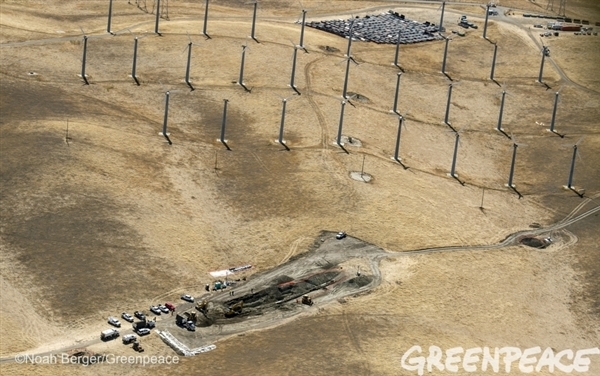 A version of this blog was originally posted on Greenpeace USA.